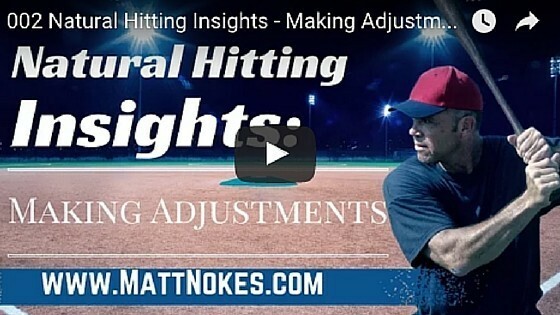 In this video I emphasize how to teach our hitters the importance of thinking for themselves while being open to feedback where both hitter and coach are focused on the same goal. • Coaches are trying to get hitters to make adjustments. • Hitters are trying to feel what they’re doing when they’re successful so they can find a way to repeat the process. • We must never get led astray by myths that over emphasize one point or another, and give that experience more weight than it deserves. • Natural hitting simply put is learning to solve our problems hitting initially through natural movements, natural timing and natural swing flow. Our Main Stream Hitting Community is made up 2.5 million players and with all those minds working for a common goal. • Understanding what “Variables” are and how we use that information to be prepared and beat the competition. • You’ll learn very quickly through our natural hitting instructional format, that knowing what you’re doing isn’t the taboo that many folks believe it is. • Knowing and understanding the process for training and rehearsing our natural timing, natural swing flow timing and natural movements, gives us the ability to cultivate a greater awareness of the big picture. • At the top of the list in “Big Picture” ideas is to always hit your pitch in your zone. • Be careful not to get led astray mechanically from a myth based an observation instead of experience. Feel free to join the discussion! I’d love to hear what you think.